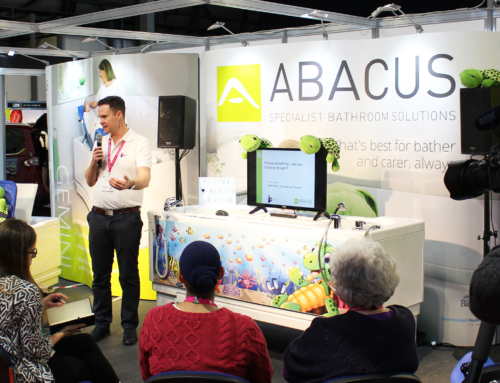 Abacus presents bathing seminar and demonstrates popular product range at a busy OT Show. Both the Abacus stand and its bathing seminar in the Showcase Theatre at the OT Show were well attended by Occupation Therapists, keen to learn more about finding the right assistive bathing solutions. On the opening morning of the show, Kate Sheehan, OT, presented an informative seminar that highlighted the importance of ‘play’ when bathing children. This engaging session outlined the relevant legislation and clinical reasoning to support the provision of an assisted bath. The seminar also detailed the various funding opportunities available when specifying bathing solutions for disabled children, particularly in regards to DFG’s. Abacus’s Product Specialists were busy, as ever, on their stand demonstrating its popular range of the Aquanova baths. As a featured product on this year’s ‘Paediatric Trail’, the Gemini is a trusted favorite for both families and OT’s. Its unique 3-in-1,variable-height platform minimizes potential back injuries for parents and carers, by reducing the number of transfers required in and out of the bath. It not only assists with bathing, it also facilitates the changing and drying process, meaning bathers remain more relaxed and are more comfortable throughout the bathing process.